Peppermint works as an expectorant and helps remove phlegm from respiratory tract. Licorice has a soothing effect on irritated lung tissue. Lungwort works as expectorant, demulcent and astringent. Plantain leaves aid in natural mucous production in the body. Your lungs are one of the most important organs of your body which work constantly to provide your body with oxygen and eliminate carbon dioxide. Any compromise with respiratory health hampers with normal body functions and lead to fatigue and tiredness. Traditional and folk medicine is usually dismissed by most of us as ineffective and even while following a course of alternative medicine, most of us are skeptical about its fruitfulness. The truth is that the herbs used in traditional medicines have proved their worth over thousands of years, and most of the pharmaceutical drugs use plant extracts to manufacture the medicines too. 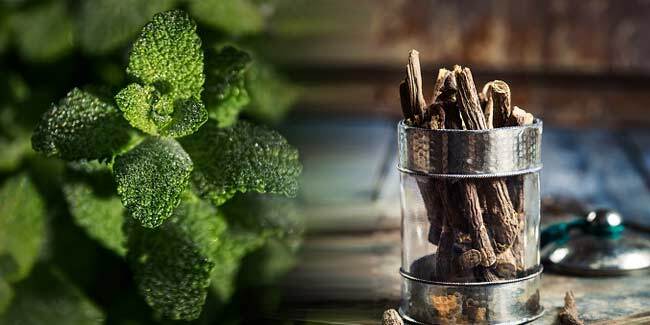 Here are some traditionally used natural remedies for lung infections which can be used to heal respiratory infections. Peppermint is an expectorant, which means it helps loosen mucus and aids its expulsion through coughing. Peppermint oil is used in therapeutic balms which are rubbed on the chest so that the vapours are inhaled directly and help in breaking down mucus and clearing nasal passages. Adding peppermint oil to hot water and inhaling the steam can also benefit lung health and help with respiratory tract infections. Licorice root is a very important herb in traditional Chinese medicine. Licorice is very effective in soothing the mucous membranes in our body. Mucous membranes are present in the stomach and lungs, and their function in our lungs is to produce mucous which in turns help removing harmful microbes and debris present in the respiratory tract. Licorice also soothes the mucous membranes and provides relief from inflammation and spasms. Lungwort is a plant and is named so because of similarities in appearance to lung tissue. It was thought that since the leaves looked like lungs, it would be beneficial for respiratory disorders. Since then, any evidence of such a link existing has not been found and the theory is discredited, however the effectiveness of lungwort plant for lung diseases was found to be a real fact. Lungwort works as an expectorant and helps break up the phlegm and aids in its removal, as an demulcent by decreasing inflammation and as an astringent which helps with recovery from infections. Plantain leaves have been used in traditional medicine for its ability to reduce cough and minimize irritation of the respiratory tract. It is believed that plantain leaves aid mucous production in the body and therefore, have a very soothing effect on the lungs. Several clinical tests have proved the efficiency of plantain leaves for cough and cold, and results show that plantain leaves are definitely effective in reducing irritation and inflammation.